One of the things I love about cake-baking is how it’s such a perfect opportunity to create a work of art. Cakes are like an edible canvas. 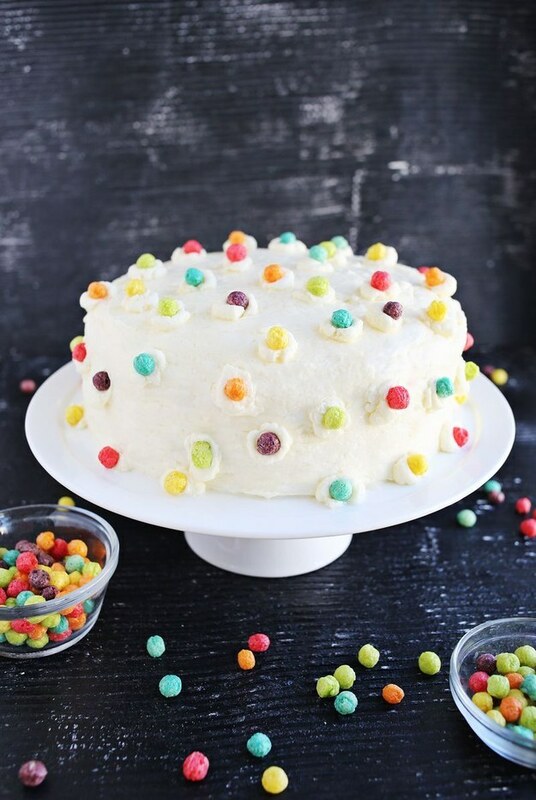 Would you think to decorate a simply iced cake with Trix® cereal? Talk about simple and yet attractive! It’s not the best picture, but what you’re looking at is a cake decorated with edible glitter. Wilton, the all-things-cake-decorating people, sells their 4-ounce bottles for $7.99. Walmart has Shimmer Dust for $6.35 a bottle, and I saw edible glitter on Etsy for $2.95. 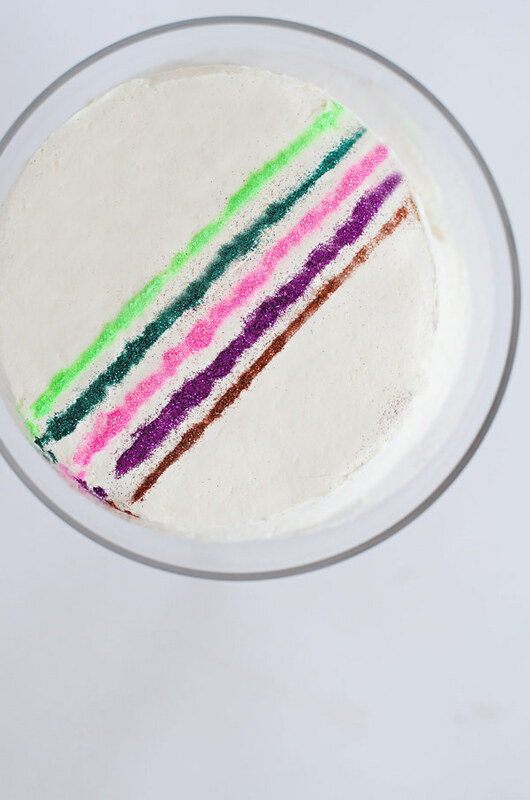 This is an easy way to add some instant glam to your cake. 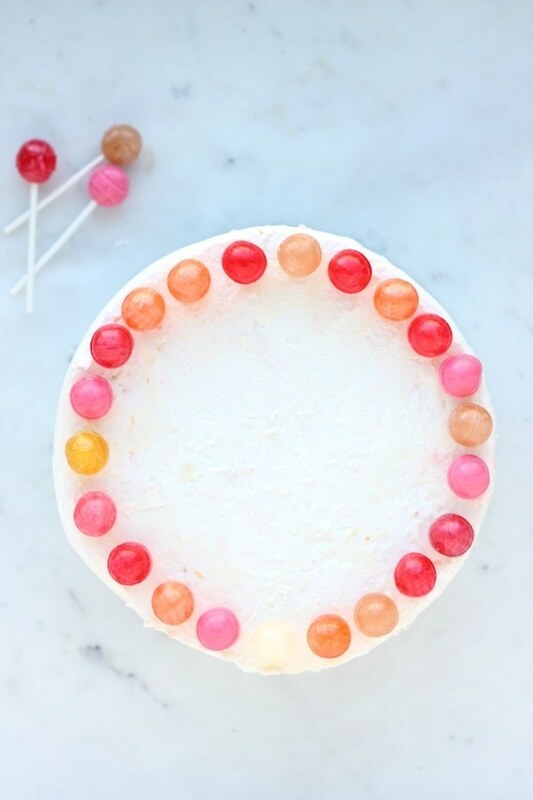 Here’s a cake topped with Dum Dums. The main caution here is to carefully space them. The sticks are a bit thick and too many, sitting too close together could crumble your cake. Then there’s rainbow Twizzlers. ®. 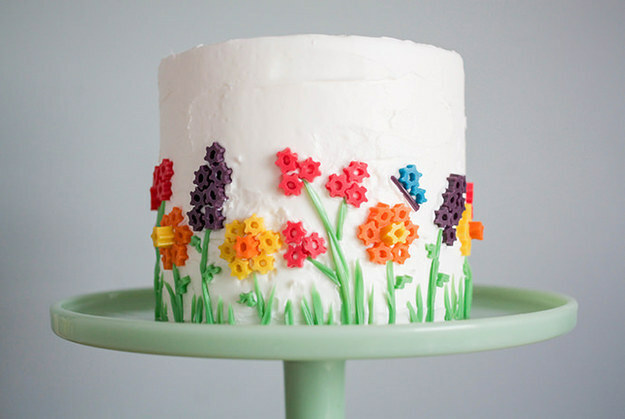 This cake artist cut them to form an edible garden. 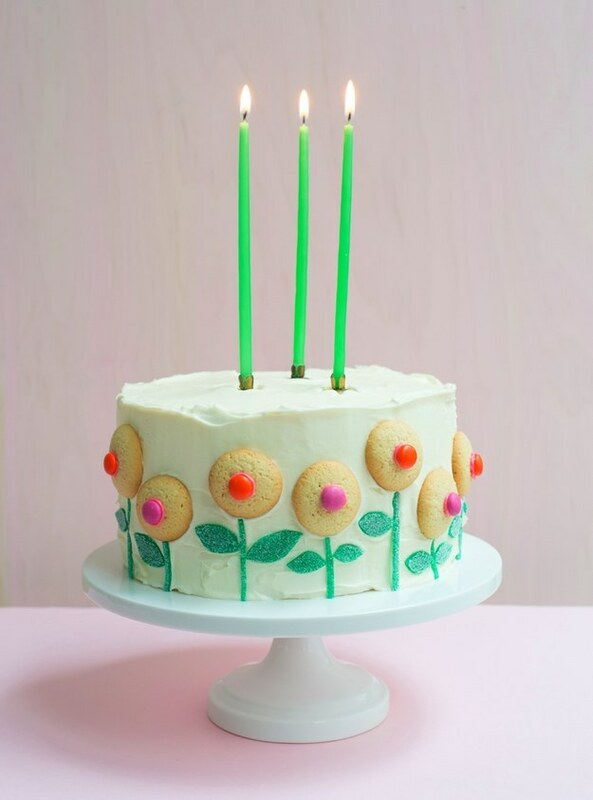 This would be fun as a spring or summer birthday cake. Another take on a floral theme is using sugar cookies and gum drops. The stems and leaves are made by rolling them flat, then cutting. 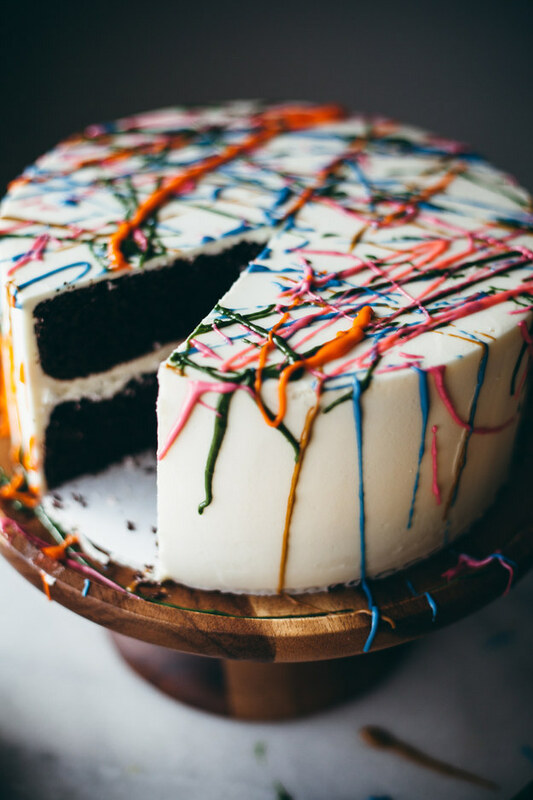 For the artsy in your crowd you might want to serve up a Jackson Pollock splatter cake. While not difficult at all, tinting icing several different colors can be a little time-consuming, but the end result is distinctive. You don’t see this every day! 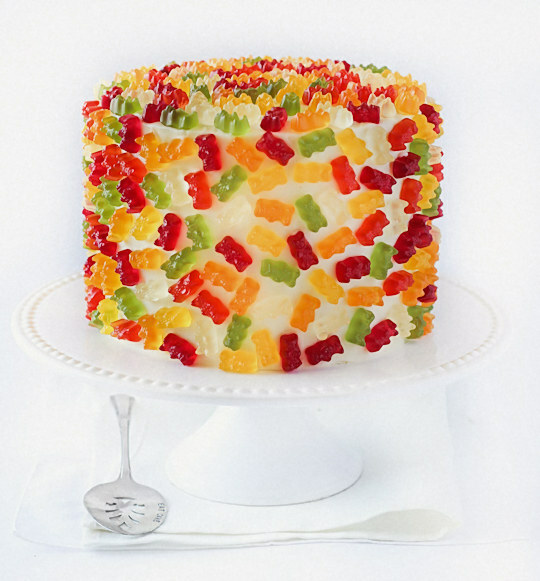 Color coordinated Gummy Bears® is another easy and quick cake decorating approach. You’d need a very thick coating of icing to anchor them, however. Perfect for the icing-lovers in the family. 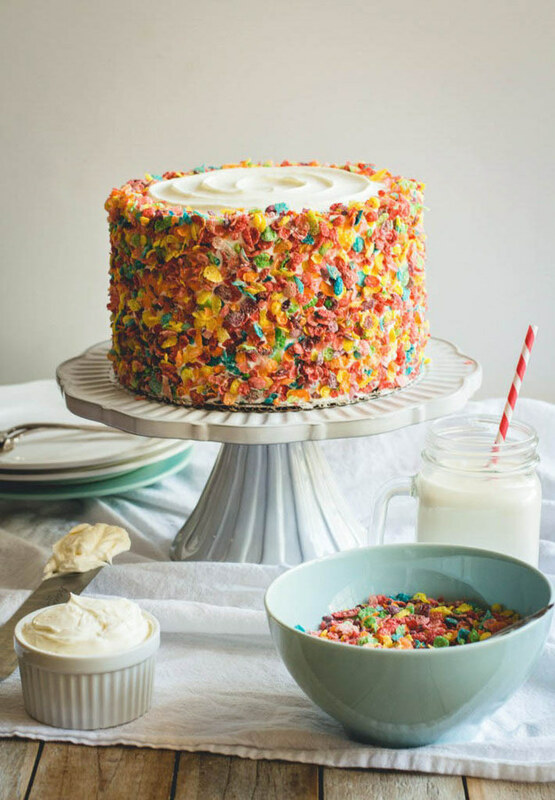 This cake is adorned with Fruity Pebbles®. It’s festive, and the crunch the cereal would add to the icing would be an interesting feature. 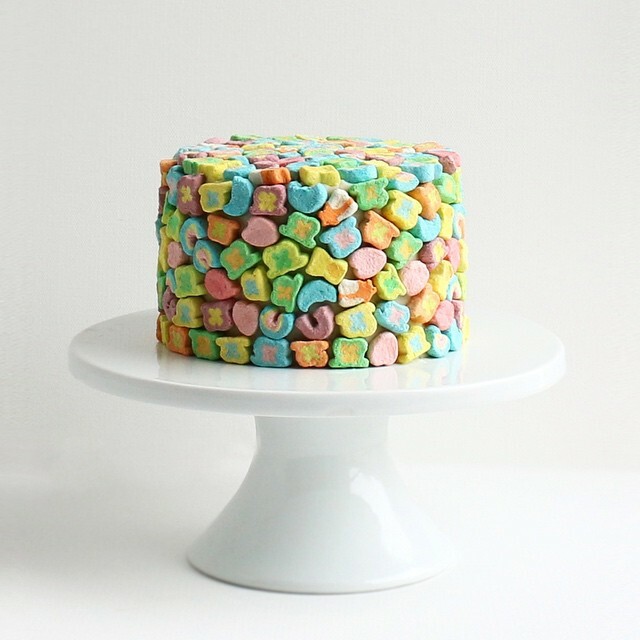 Still on the cereal kick, here’s a cake decorated with Lucky Charms®. I’ve done a lot with marshmallows, but it’s never occurred to me to turn to Lucky Charms®. A clever baker, Alana Jones Mann, came up with this idea and it’s sure to grab some attention! This might be one of the more time-consuming ideas, but it’s definitely pretty. 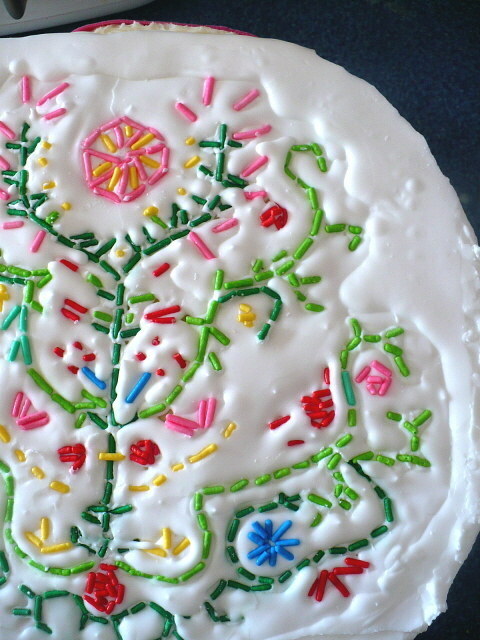 We’ve all used sprinkles, but how about “embroidering” with them? Tweezers would come in handy for this technique. Never would I have thought to put fruit snacks to this use! Is this clever, or what? Snip ‘em, roll ‘em, shape ‘em…it’s all adorable. 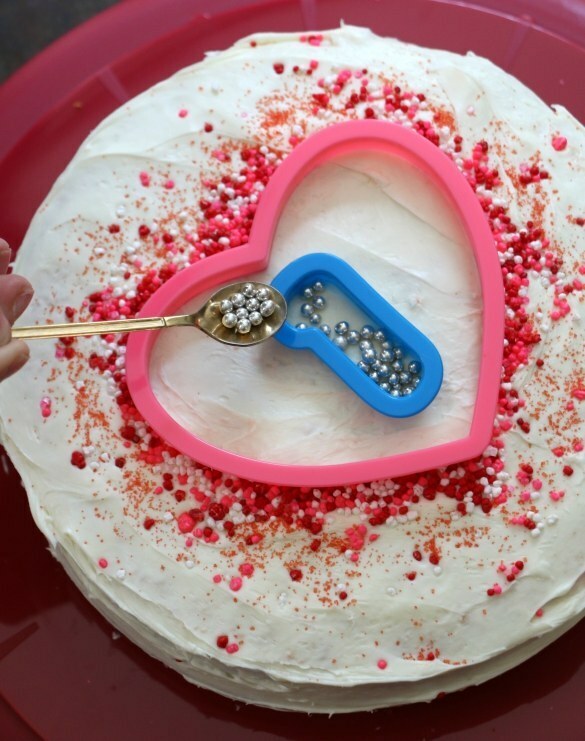 And if you like decorating with round sprinkles (aka non-pareils), then this tip is for you. This baker suggests using cookie cutters to keep them corralled as you apply them. Once you have them where you want them, lightly press them into the icing, carefully lift away your cutters, and voila! A beautiful design without the mess. This is a cool winter-weather cake! 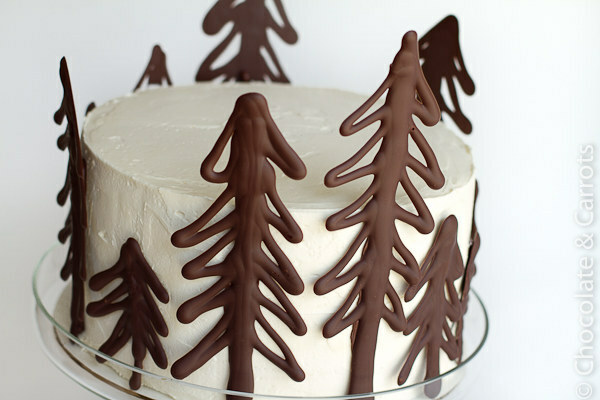 How about making trees from melted chocolate? You could also create names, numbers, and so on. Why not top a cake with dirt? Edible dirt made from crunched up chocolate wafers, that is. 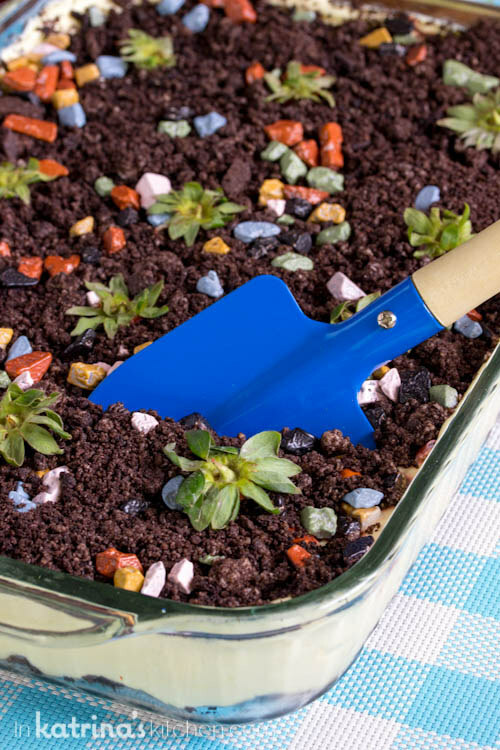 You could go in several directions with this, but this baker, Katrina (of www.katrinaskitchen.com) used chocolate candy rocks and strawberries and strawberry hulls to add a garden feeling to this. 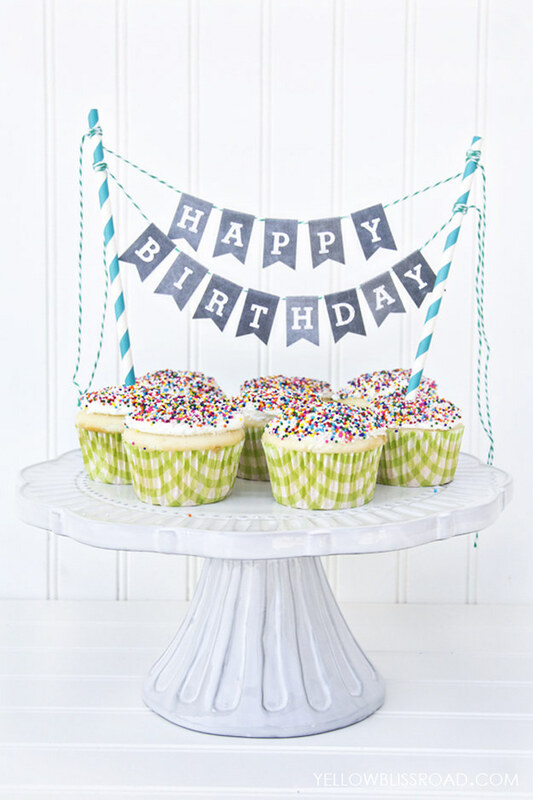 Finally, you could forgo the edible toppings and just go with a mini bunting. Drinking straws make perfect “sign holders”. And if you don’t have time to bake, bakery cupcakes grouped together can create a similar effect as a full layered cake. Holiday baking tends to cookies and pies, it’s true. But for a nice change of pace, why not go the cake route using these beautiful and creative ways to top a cake? Have fun with this!